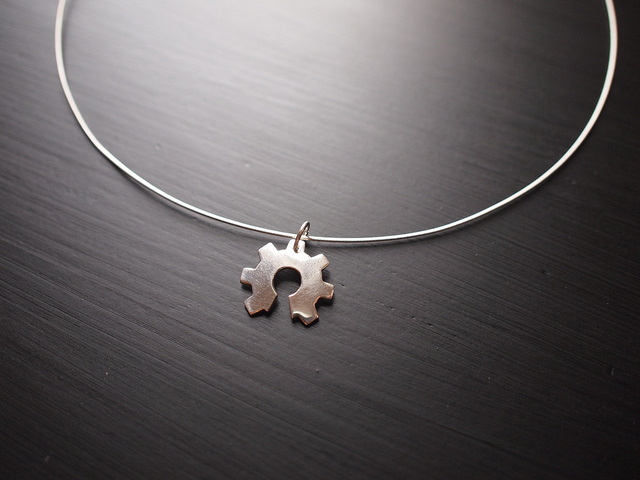 If you do want to get religious about this, you may want to wear this around your neck: Open Source Hardware logo as jewelry! Photo (CC-BY-SA) MAKE’s Becky Stern. We’ve followed open source hardware – and generally hardware that is more open to user customization and modification – on this site since the beginning. As I prepare for a talk on the MeeBlip at Berlin’s Create Art & Technology Conference, though, I think it’s time to do a proper survey of the hardware that’s out there. The ability to modify music gear is something that’s important to a lot of people as musicians. It means the ability to learn how the technology we use works, and therefore to have a deeper musical and compositional understanding of it. And it can mean the ability to make music hardware more expressive of your sonic imagination and creative ideas. Finally, it adds an additional avenue through which you can share your understanding and use and modification of musical instruments with other people. Explanation below, or just skip to the survey, or live event in Berlin. Even proprietary hardware can become more “open” in the general sense. In the early days of synths, it was commonplace to include detailed specifications and even circuit diagrams. That arguably furthered the evolution of music gear, as knowledge was shared, and it certainly allowed more advanced users to better understand how that gear worked. We’ve seen a subtle return to those days, with examples like Korg’s Monotron and MonoTribe hardware, for which the company released schematics. The viral, revolutionary spread of the monome design owes in part a community built around modification, access to critical schematics, and some open sourced software which the community took and modified. The monome, however, focuses on a fully open-source protocol and availability to schematics. Those schematics are not free for use in your own creations, which has sometimes caused friction as makers sell modified or homebrewed variants of the monome. On the other hand, many in the monome community value the handcrafted original hardware and don’t particularly want “clones” and the like, and have found the available information more than enough to fuel their musical needs. Open Source Hardware goes further, by placing everything under a license that makes it free for use. This would include the software (either running on the device, on an attached computer, or both), the schematics of the design, and even visual elements of the design, as well as the documentation. Projects that give their users the most freedom to work with any modifications they make also allow for unfettered commercial use; that is, you don’t have to worry if you sell a few, or even many, if you run afoul of the project’s original creators. Without going into the debate for or against such an approach, if this kind of sharing is your goal, then it follows it will important for you to make that freedom explicit. This sort of explicit use is also what is described in the Open Source Hardware definition, which our MeeBlip project has adopted because we feel the project and definition fit one another. I’ll say this: I think adding in the issues of economics, materials, sustainability, local manufacture, labor, distribution, and international trade make this question more compelling for discussion. It’s messier than software, yes – but given that all software relies on hardware on which to run, dealing with these messy and often demanding questions means engaging more of the many dimensions in which technology interacts with economics. Amusingly, the MeeBlip continues flying under the radar as an open source hardware project, but once we actually get our shipping picture in place over the next couple of weeks, maybe we can work on that. But first, we just need to find out what’s out there. And that’s where you come in. If you’ve got a project, or use a project, or just know about a project, let us know. If it’s your own project – especially if you feel we’ve ignored you in the past (trust me, you don’t want to see my inbox or brain) – now’s your chance to tell us about it. Because it’s the narrowest and most sharply-defined category, I’m most interested in those projects that fit the Open Source Hardware definition – not for philosophical reasons so much as taxonomic ones. But other projects are welcome, too; I’d like to hear about them.